Apart form stock preparation machine, Leizhan also provide advanced paper manufacturing machine for waste paper recycling system, framework high-speed underfeed winder is a part of paper making machine. Leizhan framework high speed underfeed winder has the feature of speciously finished paper roll, and width and tightness of paper sheet are meet the requirements. 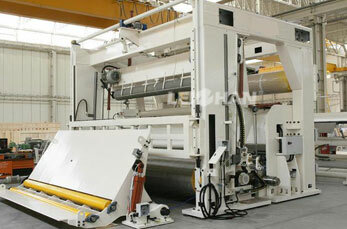 The Framework high-speed underfeed winder supplied by Leizhan consists of unreel device, stretching device, paper guide roller device, paper cutting device, rack device, transmission device, constant tension detection device, support roll device, shaftless winding device, pressure device, pushing paper device, discharge device, roller device, and the paper feeding device, the electric arc, gas, hydraulic control system and other parts.